Phillis Wheatley School, 2442 N. 20th St. Photo from the City of Milwaukee. Seven proposed affordable housing projects in Milwaukee, representing 520 affordable apartments, received low-income housing tax credits in the Wisconsin Housing and Economic Development Authority‘s latest allocation. The state awarded federal and state credits totaling $32.1 million to support 35 projects across the state planning 2,308 units of housing, with 22.5 percent of the credits going to Milwaukee projects. Governor Tony Evers announced the credit awards in a ceremony held at WHEDA’s Milwaukee office, located in the first floor of the tax-credit supported Mercantile Lofts apartment building in Walker’s Point. Evers said he was happy to make the announcement as it fits within his vision of improving the lives of Wisconsinites. “The fact of the matter is that one of the biggest impediments to leading a successful life is housing,” said Evers. The governor said the program is a successful example of a public-private partnership. “Tax credits are by far the most important tool to create affordable housing in Milwaukee,” said Department of City Development Deputy Commissioner Martha Brown. Developers leverage the credits, often selling them to institutional investors, to create equity to support new, affordable housing for individuals making no more than 60 percent of the area’s median income. The awards come from a pool of credits allocated to the state by the federal government and an associated state pool. Developers, many of which will submit a project multiple times, compete for the credits as part of an annual, competitive process. The state now has two programs. The first is the longstanding nine percent federal credit, of which 22 projects were awarded credits from this year. The second is a new program that combines a four percent federal credit with a four percent state credit. Thirteen projects totaling 975 units received credits from the combined credit program. The federal credits in each program are awarded annually for 10 years, while the state credits are issued for a six-year period. “The state tax credit program is providing almost 1,000 units that we wouldn’t have been able to provide last year,” said WHEDA commercial lending leader Sean O’Brien. And while the new program and seven new affordable housing developments in Milwaukee provide reason to celebrate for affordable housing advocates, 11 projects representing 717 affordable units in Milwaukee were placed on hold or deemed ineligible. Developer Brandon Rule received tax credits for his second development along W. National Ave. His Thirteen31 project, proposed for a city-owned site at 1331 W. National Ave., would supplement Rule’s recently completed SEVEN04 Place located one block west of the Mercantile Lofts. Rule intends to develop an 89-unit building, with 74 units set aside for those making less than 60 percent of the area’s median income. Two school redevelopments received tax credits: the 37th Street School and Phillis Wheatley School proposals. The 37th Street project, which would include 49 units, is proposed by Heartland Housing and Community First. The Wheatley project, which would include 87 units, is proposed by Royal Capital Group. The Wheatley school was the first Milwaukee school attended by Royal Capital president Kevin Newell. 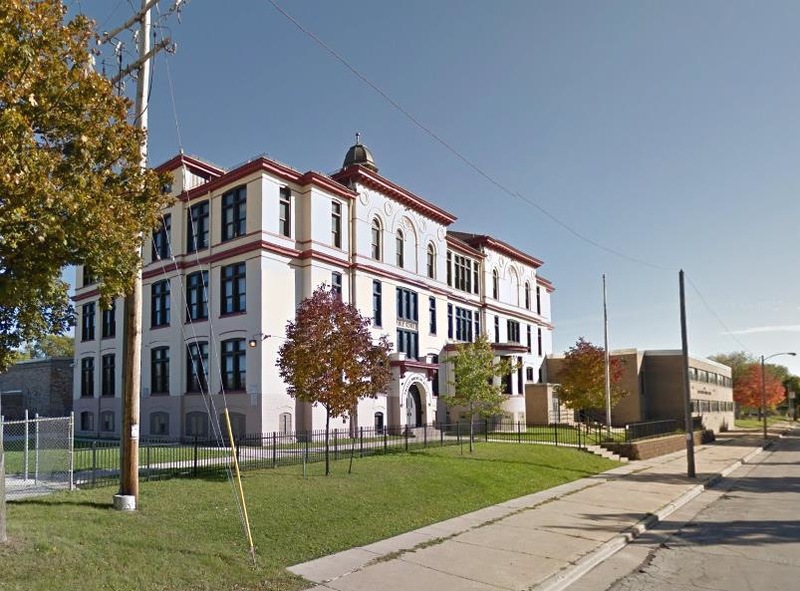 Both schools, deemed surplus by Milwaukee Public Schools, are currently vacant. Both Rule and Newell’s projects are located within federally-designated Opportunity Zones, which could attract additional investors to the projects for income tax deferrals or reductions. Another school proposal, Gorman & Co.’s plan to redevelop the former McKinley School into apartments, was placed on hold by WHEDA. Brown told Urban Milwaukee that the city is exploring its options on what to do with the city-owned building. “It’s going to be a challenge,” said Brown. Gorman did successfully secure $717,064 in state and federal credits for the second round of its scattered site program. The program will redevelop 50 units of housing spread across the city in properties the city acquired through property tax foreclosure. Another project that the city has sought to advance finds itself somewhat at sea. Villard Commons failed to receive its supplemental credit allocation intended to close a financing gap it faces; the firm was already awarded credits in a prior year, but was applying for additional credits to fill that gap. The $95,900 request was placed on hold. The development team, made up of Brinshore Development and Index Development Group, will now need to decide whether it will wait to apply again next year or find an alternative to close the gap. “We’ve already been talking about what alternatives there are,” said DCD redevelopment and special projects manager Maria Prioletta. Developer Que El-Amin, who is part of the team working on the Villard Commons project, also had the first phase of his The Community Within the Corridor proposal near Sherman Park placed on hold for the second straight year. A proposal for the project’s second phase was made to the combined federal-state program and deemed ineligible. The developer is also part of the Glendale Commons proposal on the city’s border that was placed on hold. In addition to Villard Commons and the McKinley School, other projects placed on hold include Woda Cooper‘s Olson Place proposal to build a 90-unit building in Walker’s Point, CommonBond Communities‘ proposal to redevelop the 90-unit Meadow Village Apartments, Crown Court Properties’ plan to build a 20-unit building at 535 W. Concordia Ave. and Sunny Side Development’s rehab of a 64-unit, single-room-occupancy apartment building. The Housing Authority of the City of Milwaukee (HACM) secured $889,430 in tax credits to redevelop its Merrill Park complex at 222 N. 33rd St. The project would include redeveloping the nine-story, 120-unit building with 100 units set aside for those making less than 60 percent of the area’s median income. HACM currently accepts residents age 50 or older or residents with disabilities at the complex. It was originally completed in 1967. HACM also secured $3,565,457 in state and federal credits for the continued redevelopment of the Westlawn housing complex. The authority has been demolishing existing structures on the site in phases and replacing them with new buildings. The newest award will support “phase 4B” intended to create 138 affordable units. HACM did, however, have its plan to redevelop the Becher Court complex at 1802 W. Becher St. placed on hold. Madison-based Wisconsin Housing Preservation Corp. was successful in its efforts to secure $472,000 in combined state and federal credits for its 48-unit Main Street Gardens and Cleveland Terrace project. The Perlick Historic Lofts project, proposed by Wisconsin Redevelopment, and the Clark House, a single-room occupancy building redevelopment by Sunny Side Development, were the only Milwaukee projects to be ruled ineligible by WHEDA under the nine percent federal program. The developers will need to revise their proposals to be considered for credits. Location: 1715 N. 37th St. Location: 1802 W. Becher St. Location: 933 N. 24th St. Location: 1500 W. Custer Ave. Developer: Wisconsin Housing Preservation Corp. Location: 6024 W. Main St., 2733 S. 14th St. Location: 2001 W. Vliet St. Location: 1470 N. 17th St. Location: 222 N. 33rd St. Location: 100 E. National Ave. Location: 535 W. Concordia Ave. Location: 3100 W. Meinecke Ave. Location: 2442 N. 20th St. Location: 3212 W. Center St. Location: 1313-1331 W. National Ave. Location: 3600 W. Villard Ave. Location: 6236 W. Birch Ave.